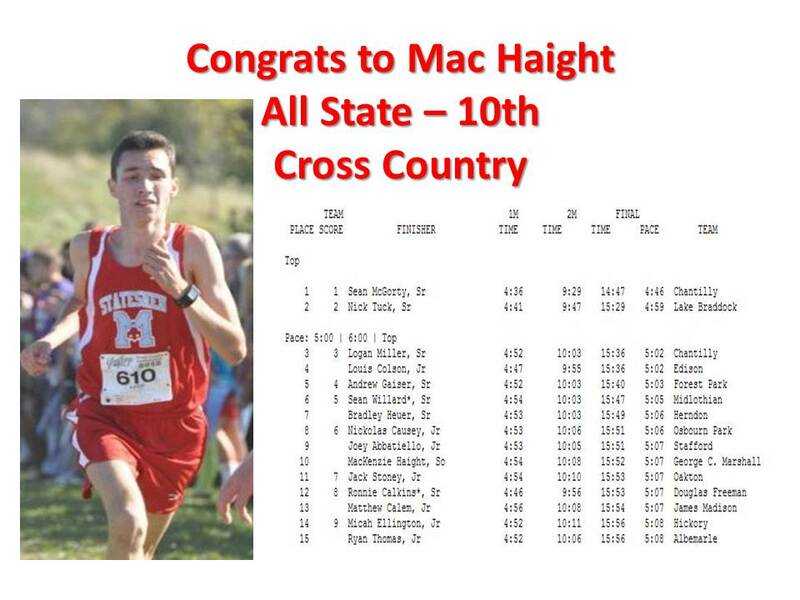 7th Time All-State Honoree, won 6 Conference and District individual title, 2 time All-Met Selection, Footlocker Cross-Country National Finalist and will leave Marshall holding 12 school records. *Won with a 5 second Personal best and Conference Qualifier. Congratulations to team on a wonderful performance this weekend at Dunbar. 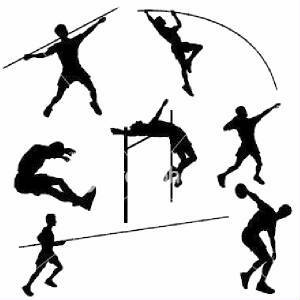 Rain is forecast for all day on Tuesday - so we will be moving the Distance runners and Throwing to Monday. The 2nd day will still be on Thursday. 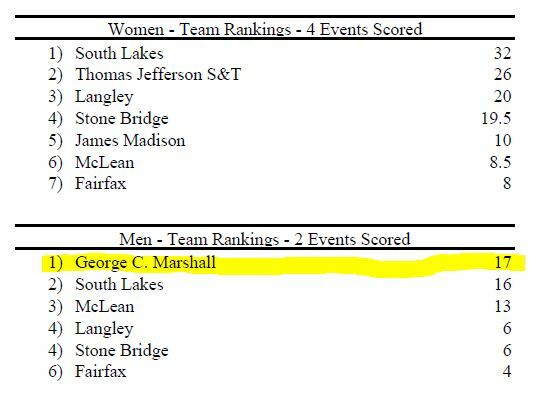 Post by George C. Marshall High Track and Field. 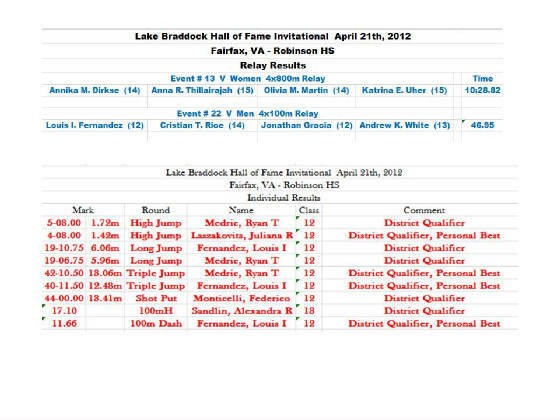 *Fastest time in the event indoor or outdoor. 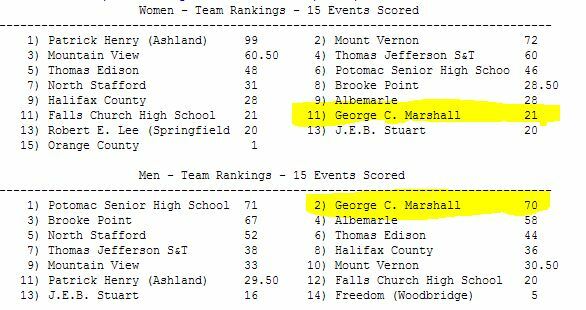 *Historical first ever indoor track and field conference title for Marshall HS. 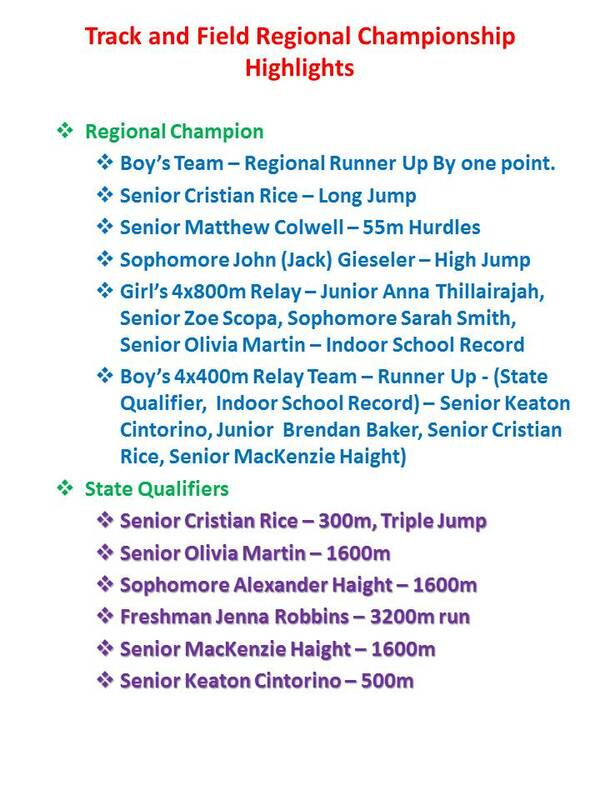 Statesmen School Record under any conditions (indoors or outdoors). 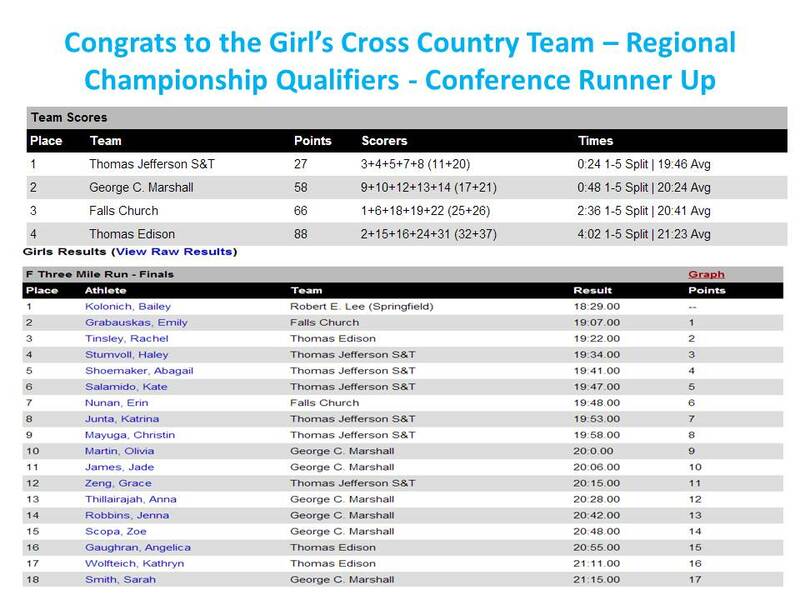 Congrats to the Girl's and Boy's teams placed 2nd and 3rd in the Conference Championship and qualified for Regional champs - the first time in over 15 years. Congrats to the Coaching Staff too. 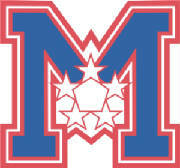 Hope everyone is enjoying the first snow of the season and they snow day off on Monday (No practice on snow days). I want to say THANK YOU, THANK YOU very much to each and every one who show up and make our first invitational and Statesmen Polar Bear Meet an exceptional success. The only thing that could have made it better was over 60 degree weather. 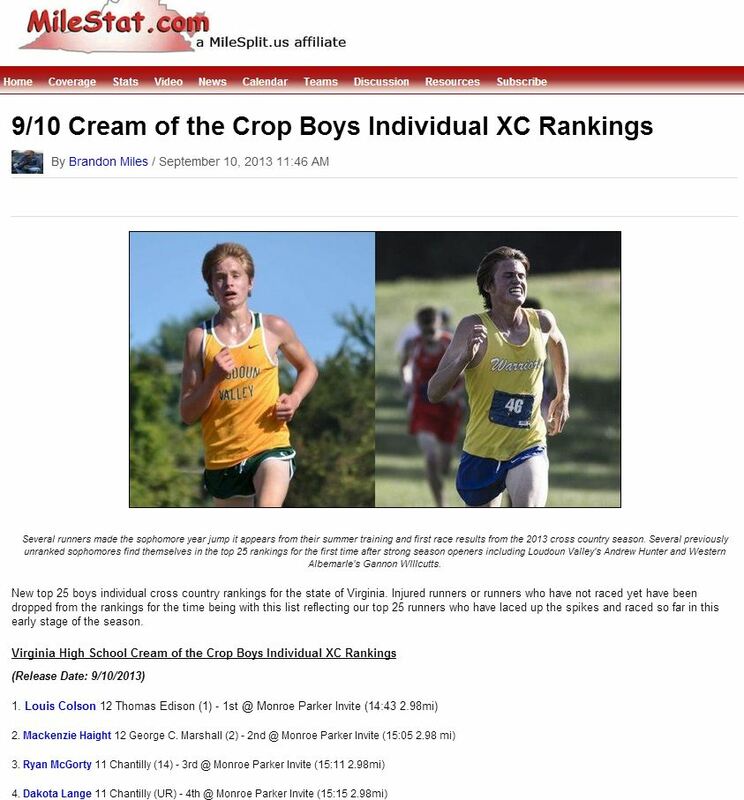 It was a complete success starting from the ticket taking, to the concession, to the scoring to the timers, the starter, the coaches, administration, athletics trainers, the opposing school attendance and the athlete’s performances on the track and field. We all should be proud of ourselves, we did great. We could not have pulled off that kind of success without the great support from everyone. The level of support showed up on the track and field as the athletes brave the cold and winds to achieve some great time for the first meet. 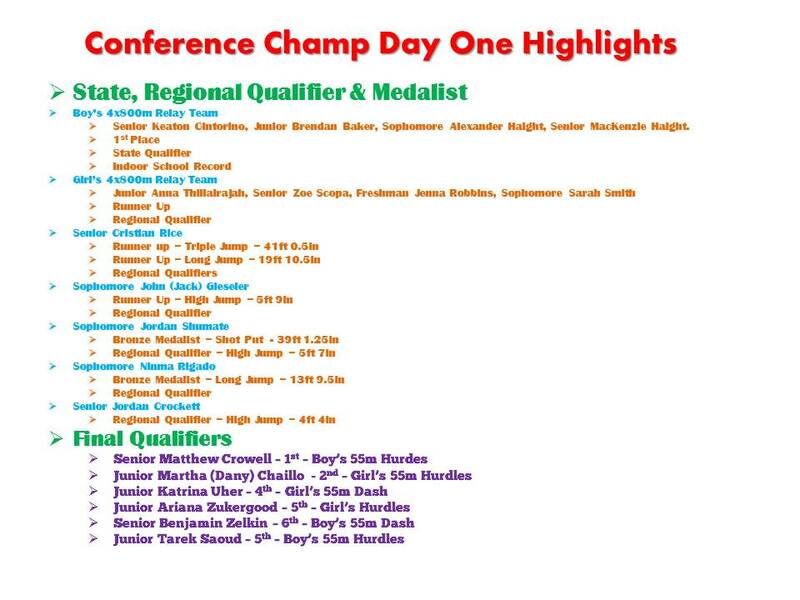 There were 190 personal best, 22 lettering mark and 4 conference qualifier achieved. 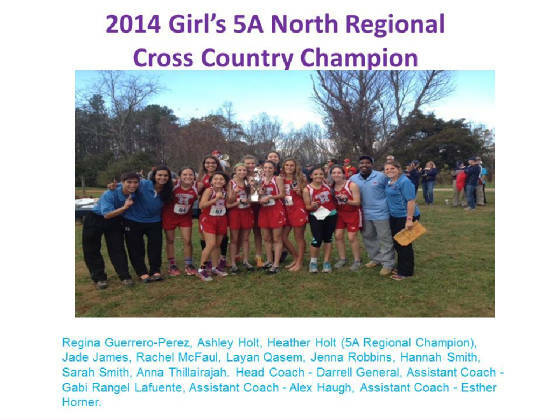 Our next meet will be Friday, Dec. 13th at Thomas Jefferson Middle School (this meet will be indoors). The buses leaves at 4:15PM from the kiss and ride, the meet doors open at 5:00PM and the meet starts at 5:30PM and expect to end about 10:30PM. 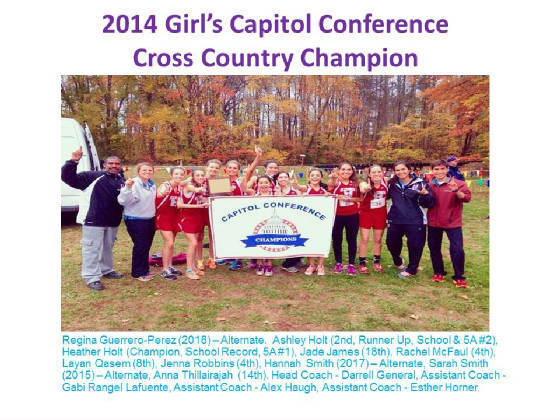 Congrats to the girl's Cross country team winning there Quad meet with almost a near perfect score. They scored 20 point - the lowest you can get is 15. Congrats to Ryan Medric on qualify for the VA AAA State Championship in the Long Jump. 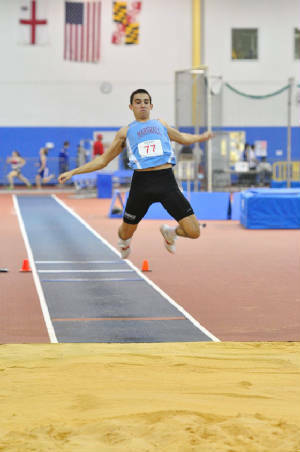 Congrats to Ryan Medric who finished tied for 10th at the VA State Championship in the long jump (21ft 4in). He came in the meet ranked 30 and last and finished 2 inches from making the finals. Girl's 4x800m Relay team ran one of the fastest time in 12 years - the team of Annika Dirkse, Anna Thillairajah, Olivia Martin and Katrina Uher post a mark of 10:28.82 for 9th place. Senior Juliana Laszakovits hit the Liberty District Qualifier for the 3rd staraight meet and grab a medal in the High Jump (4ft 8in). 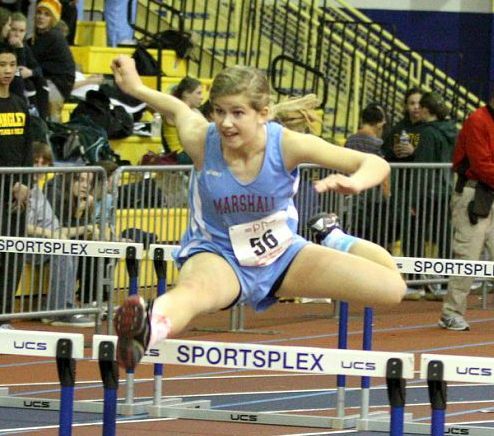 Junior Alexandra Sandlin hit the District Qualifier mark in 3 of 4 meets this season in the 100m Hurdles. Sophomore Olivia Martin had a 12 second personal best in the 800m run. Sophomore Sarah Carlson had two big personal best in the 100m and 200m. On the Boy side, the 4x100m relay team of Louis Fernandez, Cristian Rice, Jonathan Gracia and Andrew White ran a top 10 fastest time in the last 12 years with a 46.95. 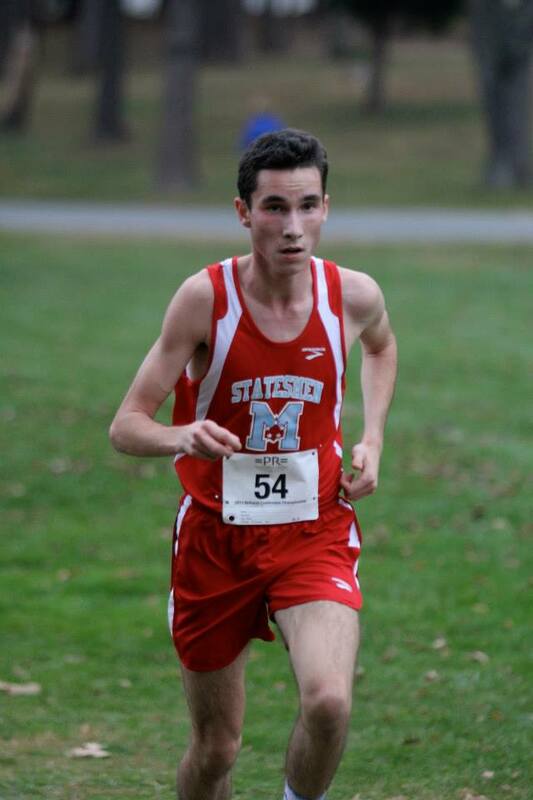 Senior Louis Fernandez competed for the first time this season and make it count. Qualifying for the Liberty District Championship in all his individual events (100m, Long Jump, Triple Jump) - grabbing medals in the Long and Triple Jumps. Senior Ryan Medric hit the District qualifying mark in his three events (High Jump, Long Jump and Triple Jump) including a personal best and runner up in the Triple Jump. 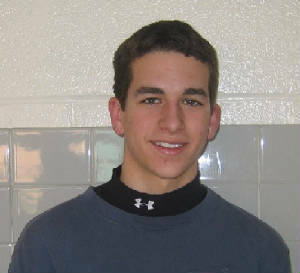 Senior Federico Monticelli qualified for the Liberty District in the shot put and took home a 5th place medal. 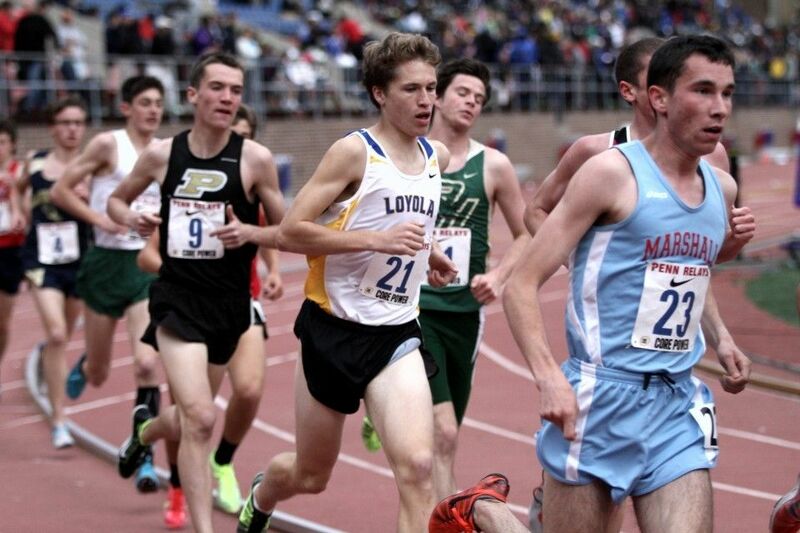 Senior Sean Ryan broke into the sub 5 minute mile class with nearly 3 second personal best of 4:57.69. 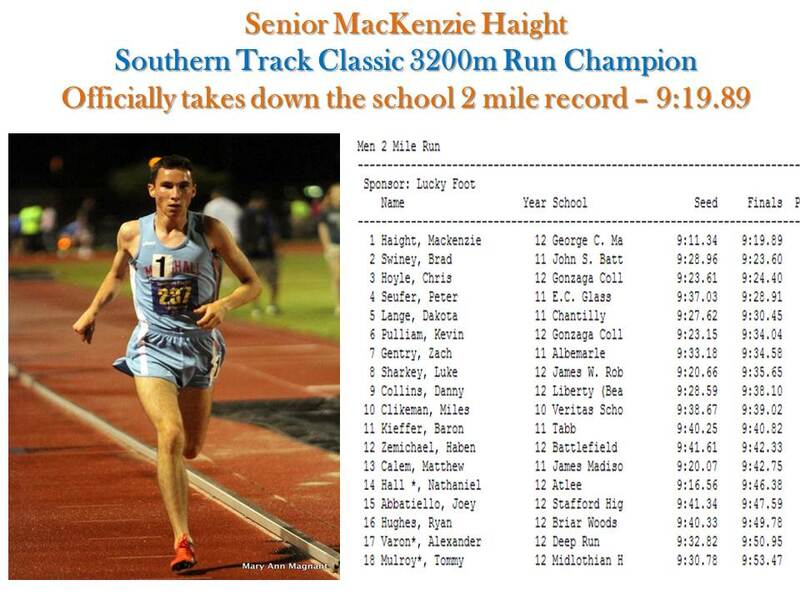 Senior Nicholas Zirkle has a nearly 14 second personal best in the 3200m. Junior Andrew White had three personal best in the LJ, 100m, 200m. 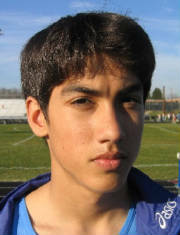 Sophomore Cristian Rice stepped in and drop nearly 3 second off his personal best in the 400m. 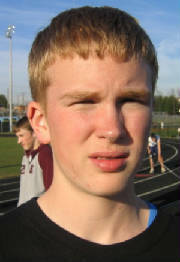 Sophomore Matt Colwell had two personal best in the 100m and 300m Hurdles. Boy team finished an amazing 3rd in the meet and Girl's team finished 5th. At least one school record was set by Sophomore Zoe Scopa in the Girl's 2000m Steeple Chase. 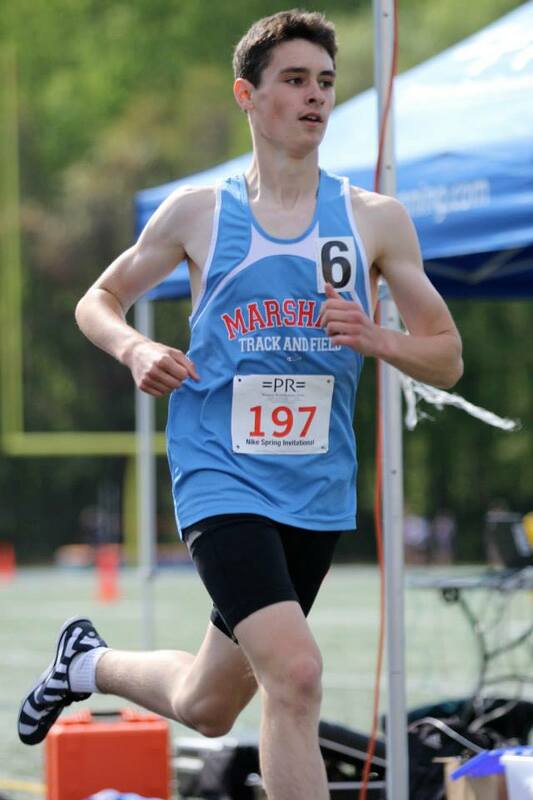 Sophomore Peter Morrissey set a Wong Record (means fastest time since Coach Wong been at Marshall) in the Boy's 2000m Steeple Chase. Congrats to everyone on a wonderful start to the season. 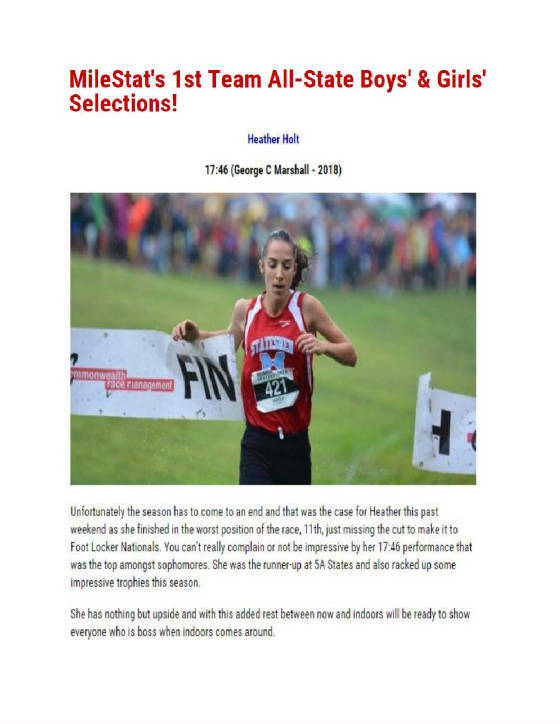 Ryan McElveen was a Marshall track athlete between 2002 and 2004, and on Monday, April 4, he announced his candidacy for an at-large position on the Fairfax County School Board. While on Marshall track, Ryan won the Best Newcomer Award in 2002 and the David Lin Award in 2004. You can visit his website at http://www.ryanforschoolboard.com. 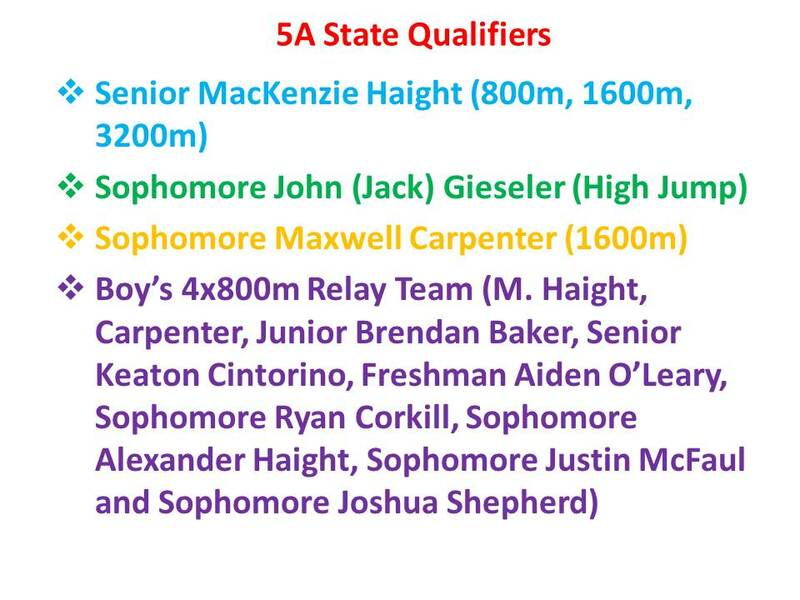 This is the final meet to earn a spot to the Liberty District Championship. It will serve as a final audition to secure the Lettering standards or earn your spot by winning a BATTLE. Here are the BATTLES for this weekend. FIT Invitational 2010 Girl's 300m dash - Freshman Sarah Carlson - winning her heat in a personal best and lettering standard mark of 48.75. Dropping 3.59 sec off her pervious personal best. Regional Champs - Day One - Senior Brittany Johnson placed 2nd in the Long Jump with the 2nd longest jump in school history 17ft 11.25in. 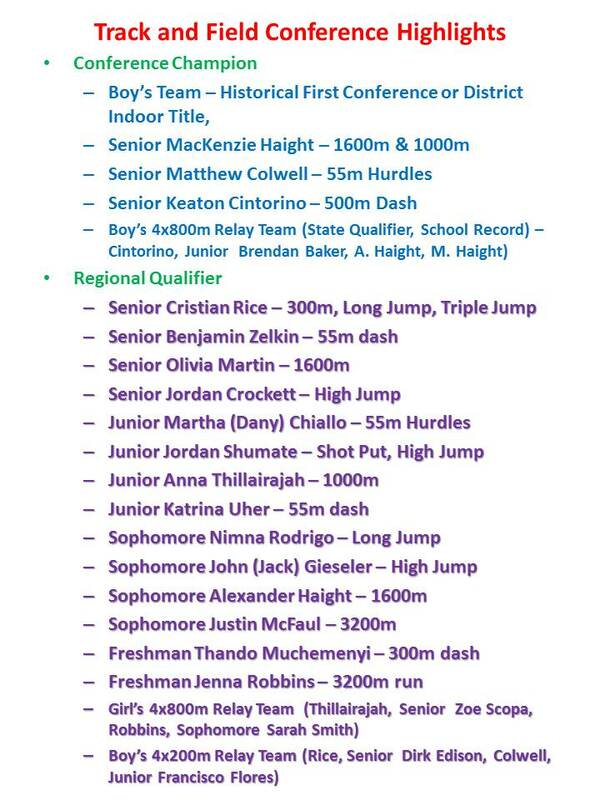 Miss taking the regional crown by one inch. She is the fastest qualifier going into the 200m dash final and the 2nd fastest qualifier in 100m dash final. Also, Junior Marshe Williams qualified for the 400m dash finals. 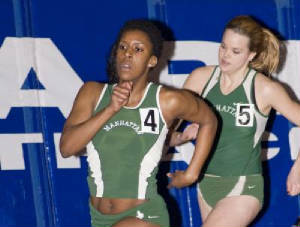 Jacqueline Hargrove (C' 2007) - Manhattan College - wins MAAC 400m conference title (58.19) and make the All-Academic Team with 3.85 GPA. 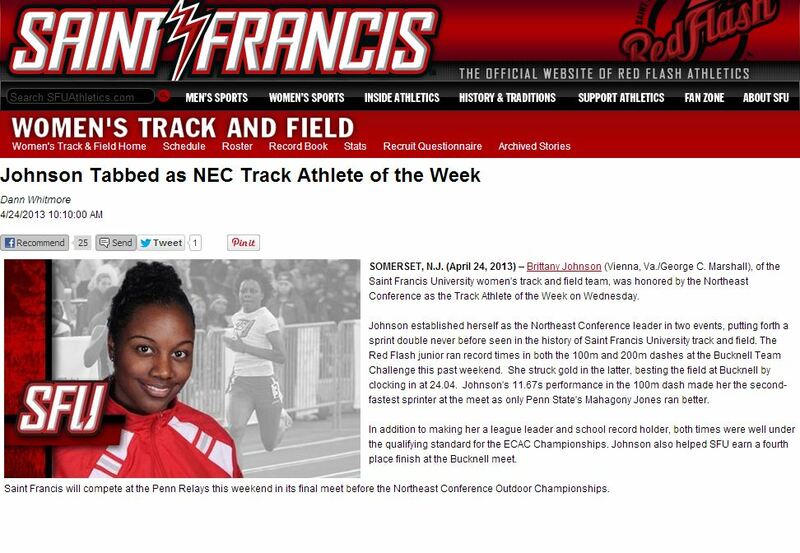 Congrats to Ms. Jacqueline Hargrove. 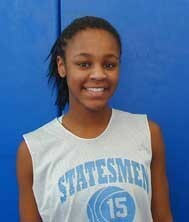 She will be attending Manhattan College in NY this fall on a full athletic scholarship. 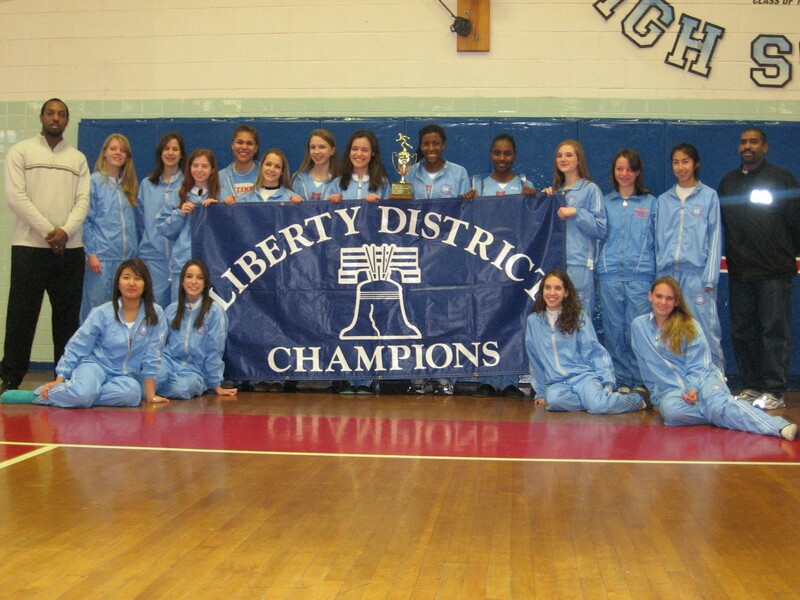 Congrats to the Lady's Statesmen on Winning the Liberty District Championship, the first in 11 years. 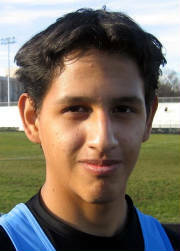 Flashback - 11 years Ago !!!!!!!!!!!!!!! ++Hargrove crowned 300m champion - School Record and Meet Record, Shot Put Champion, Silver Medal in 55m dash, TJ, LJ & HJ, 4x400m. ++McVey crowned champion in 55m dash, Silver medalist in 300m dash and 4x200m relay. 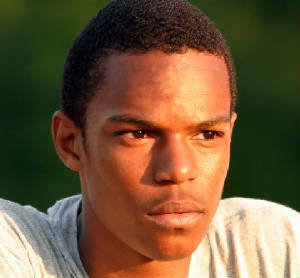 ++Johnson qualified for Regional in 55m dash, silver medalist in 4x200m relay, medal in HJ. ++Cheng crowned Triple Jump champion, medal in 55m hurdles. 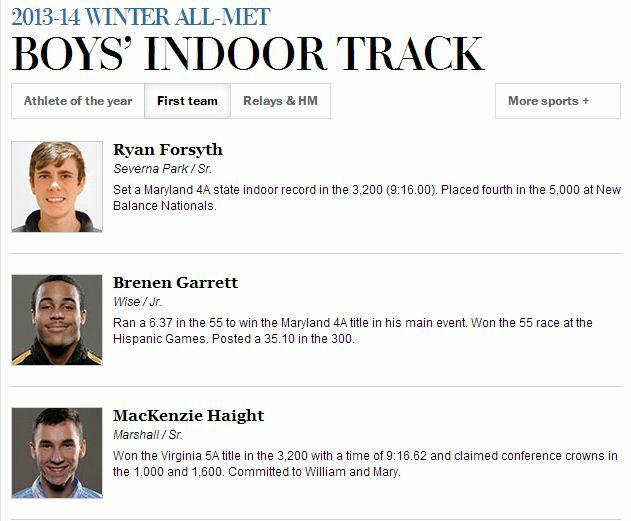 Senior won the 500m dash @ Southern Mega Indoor Track and Field Invitational with a States, Regional and District number one ranking mark. 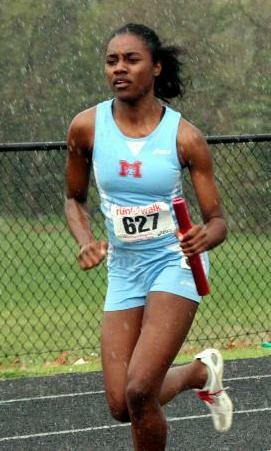 She was also a part of the seasonal and two years best and bronze medal 4x400m relay team. 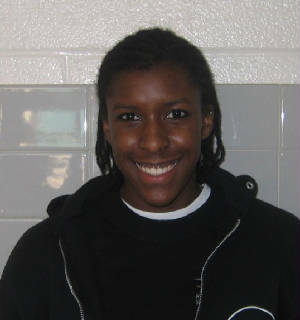 Senior won the High jump @ FIT Invitational Friday, December 29th, 2006 equalling her personal best, State Auto Qualification and Northern Regional and Liberty District #1 Ranking. Placed 2nd in the 300m dash in a Regional Qualifying and Liberty District #1 Ranking. 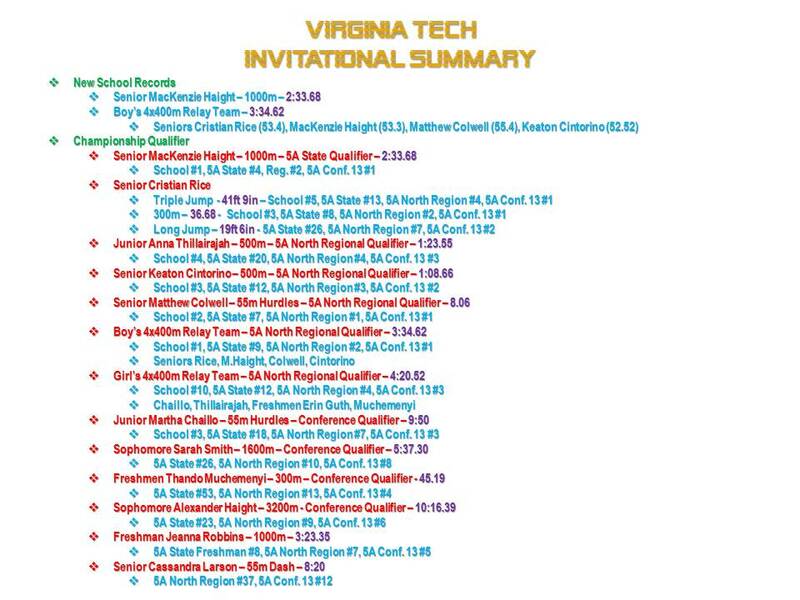 Junior won three events at the opening meet of the season vs South Lakes, WT Woodson and Mount Vernon. 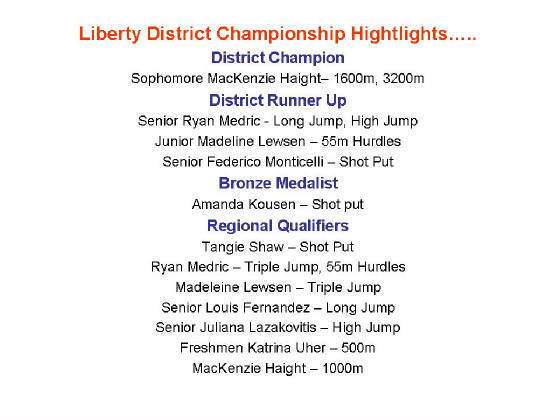 Personal best and Liberty District automatic qualifying perfomance in the 55m hurldes. Also, won the long and triple jump. Freshman started her career by winning the 55m dash and capturing two second place finishes in the long and high jump @ the opening meet of the season vs South Lakes, WT Woodson and Mount Vernon. 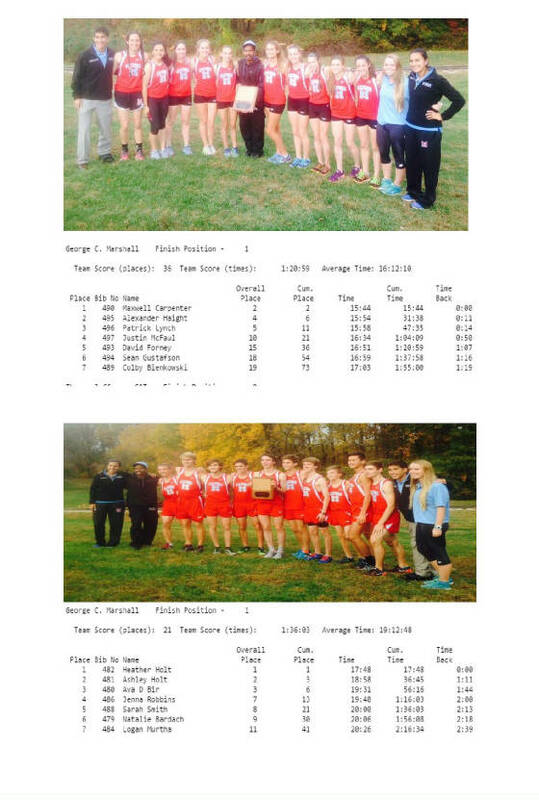 Broke the old record set by last year team (Olazo, Cvrk, Joel Ryan, Pennington) at Regional championship of 8:16.14. 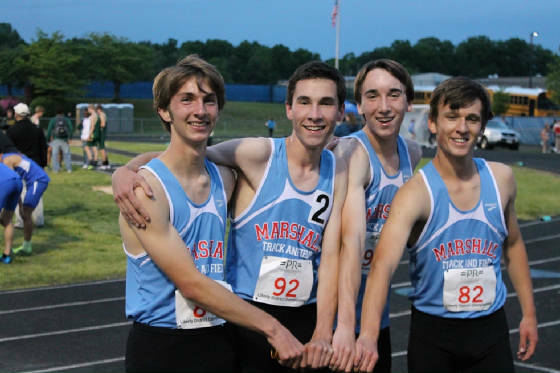 *Lead off leg on the fastest 4x800m relay in school history. 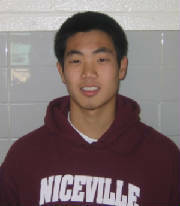 2006 Winter Track and Field Awards Pictures. 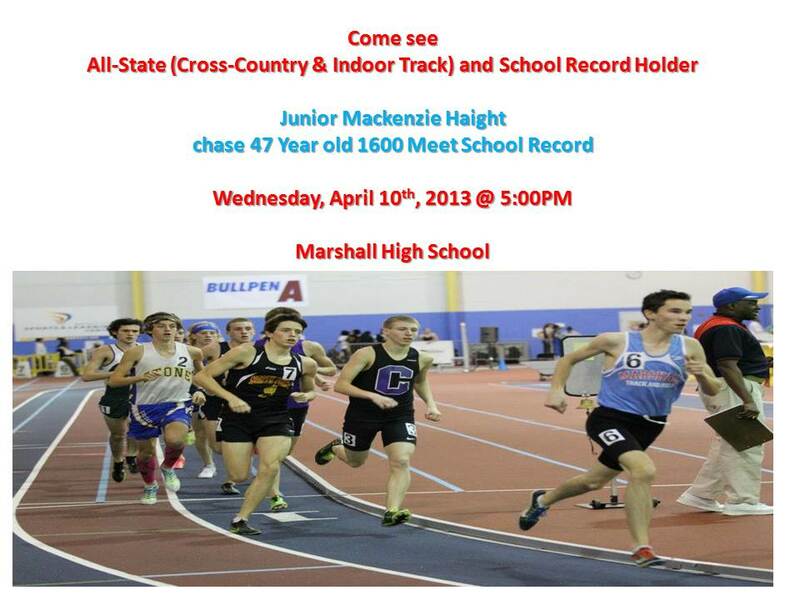 Marshall High School latest school record breaker. 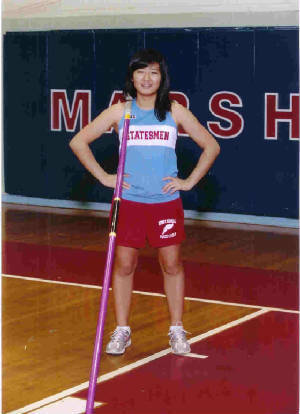 Congrats to Sophomore Katherine Heffelmire on becoming the first woman in George C. Marshall's history to clear a height in the Pole Vault. Check out the full story in the Results/Team News section. 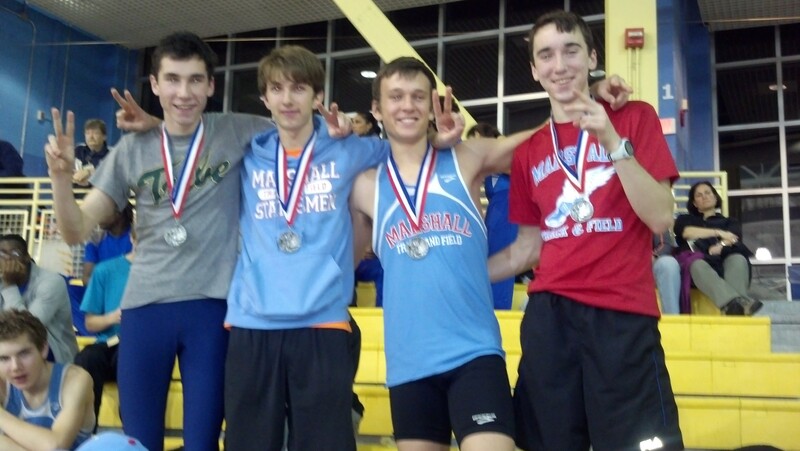 27 year old 4x800m relay School Record Falls!!!!!!!!! 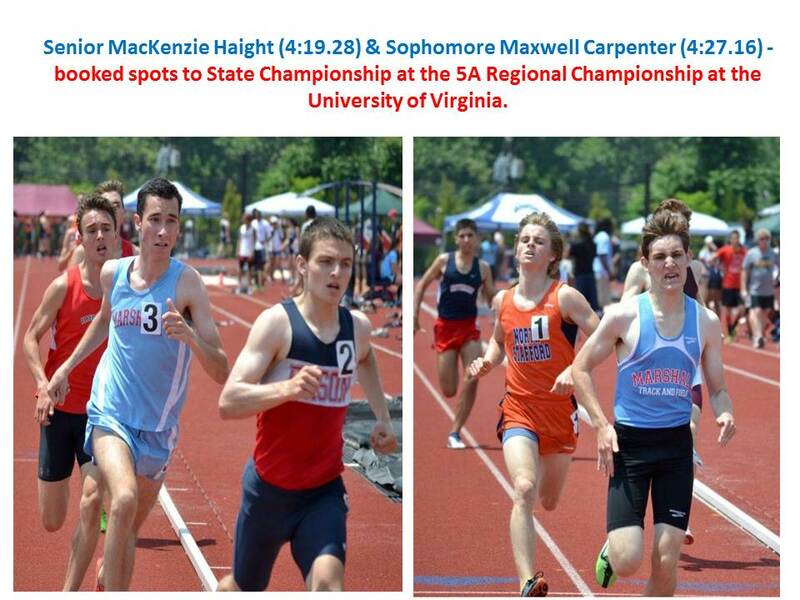 Missing a New School Record by half a second (8:20.44 to 8:21.16). 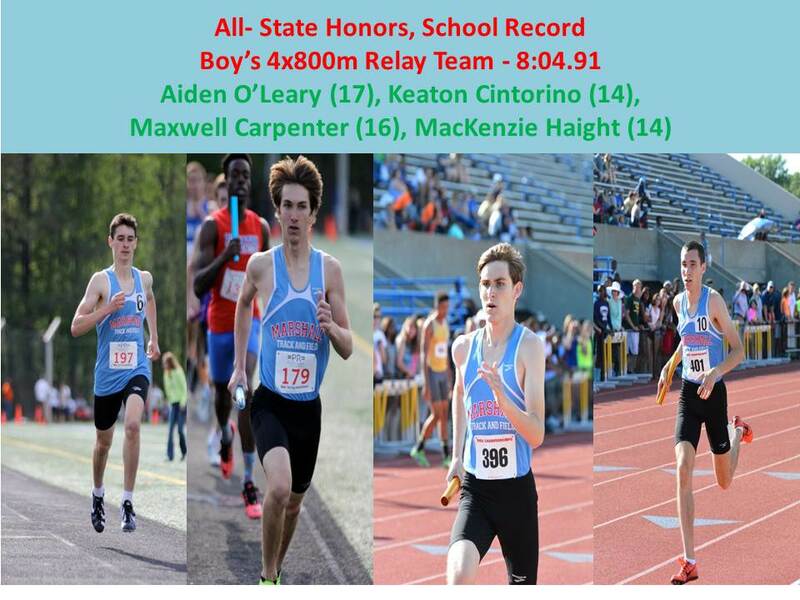 2nd fastest 4x800m relay in school history. 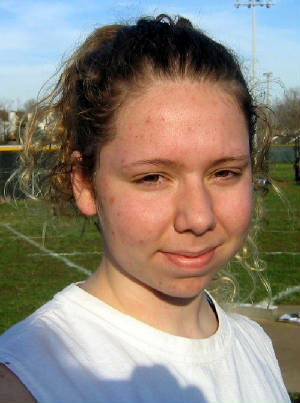 *Won the 800m run @ Tri-meet vs Mclean & Madison. 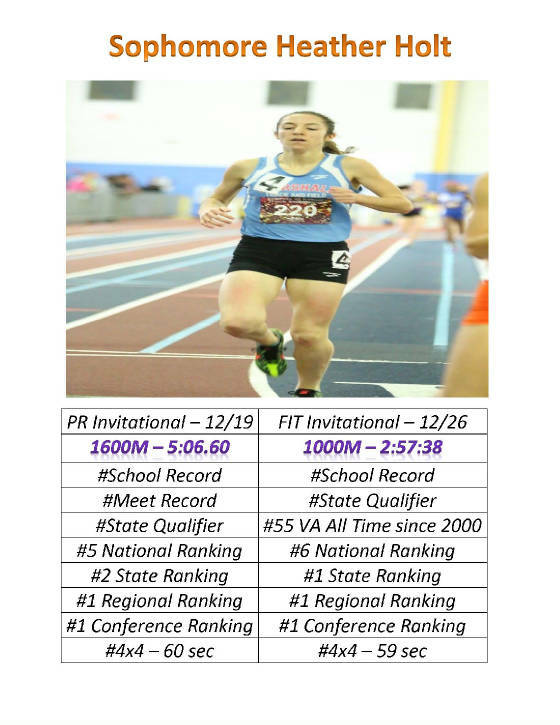 *Came within three seconds of breaking the School record in the 800m in winning the event @home versus Lee & Woodson. 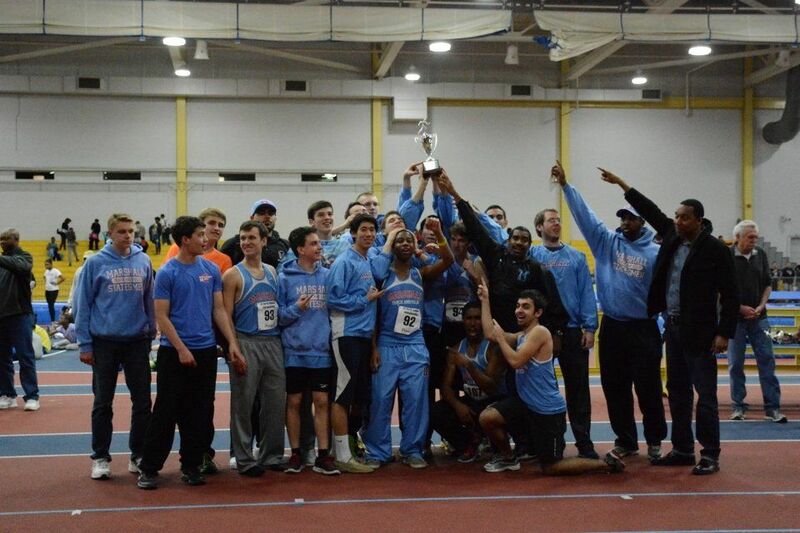 Won 3200m run @ home versus Lee & Woodson, the 2nd fastest time in 5 years. *Grab 5th place medal in the 500m. *Grabbed 4 Medals in 5 event. broke the school record in placing 2nd in the 500m dash, Bronze medals in the triple and high Jump. District Runner Up - High Jump (6ft 0in), 4th - Triple Jump (39ft 7.75in), 6th - Long Jump (19ft 8.25in). Sponsored by Col. Matthew Coatsworth & Elizabeth Coatsworth. 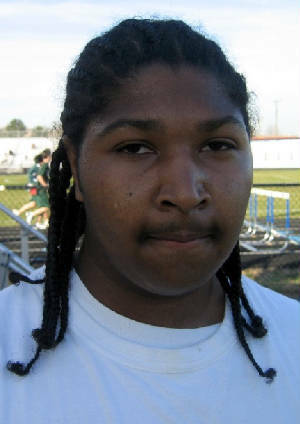 Captured 6th placed in the Shot Put with a mark of 25ft 4.5in. 4th - 300m dash (45.32), ran fastest time of 44.64 in semi-finals. 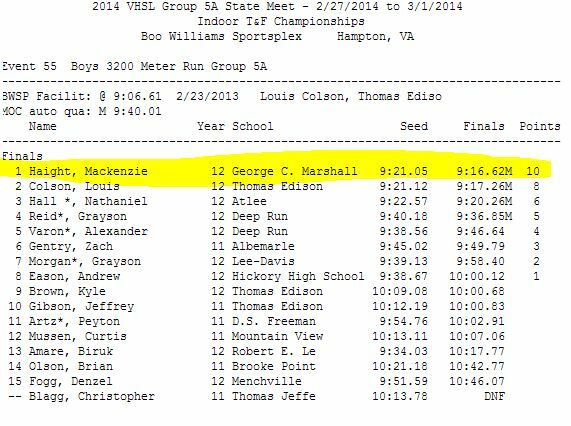 6th - 1600m run (4:46.04), missed making to regional in the 1000m by a photo finish 0.01 of a second. Jan. 29th to Feb. 4th, 2005. Placed 8th of 153 at Virginia Tech Invitational in a VA State automatic qualifier, broke her own G.C. 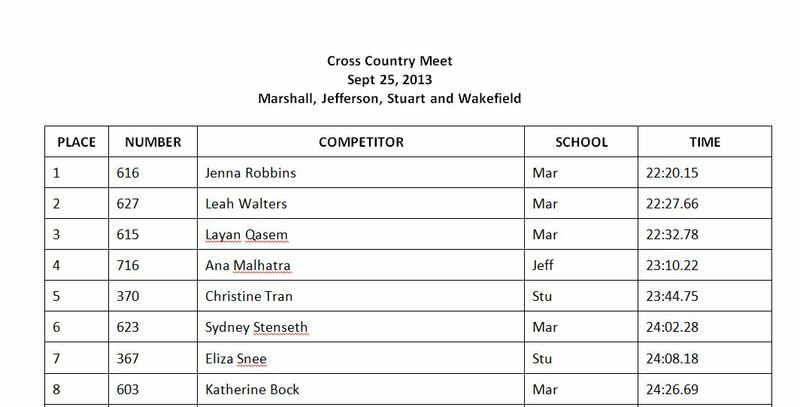 Marshall School Record, and ran the fastest time in the Northern Regional this season. Also, anchored the 4x200m relay team to the 3rd fastest time in school history. 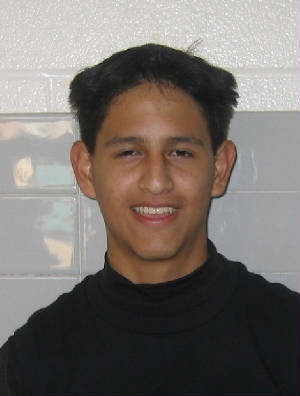 Jan. 15th to Jan. 22nd, 2004. Automatically qualified for Liberty District Championship by running a personal best time of 8.04 in the 55m dash. Monroe was the lead off leg on the 2003-2004 all Freshmens 4x200m relay team at the Northern Virginia Regional Championship. Captured 2nd in the High Jump competition with a Regional Qualifying mark of 6ft 0in. Team's only medallist @ the F.I.T. Invitational and he's the reigning indoor and outdoor MVP. 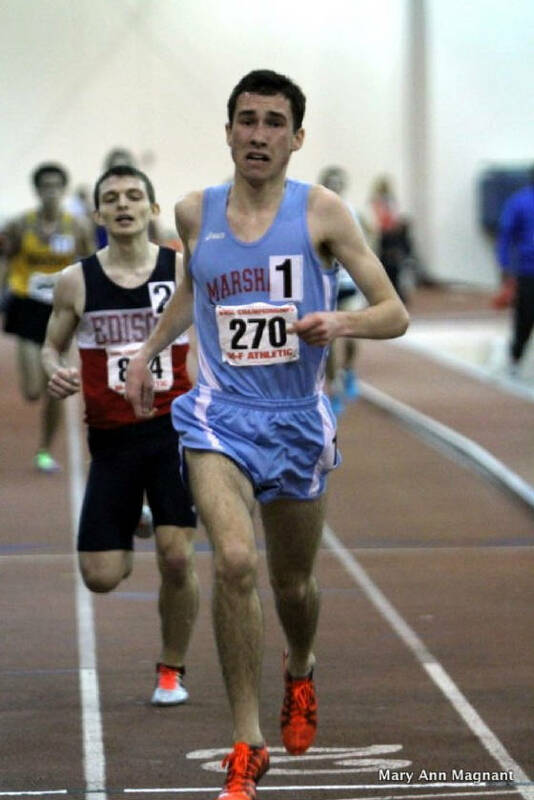 Won the 1600m run in a personal best time @ the Five Way meet versus Jefferson, Yorktown, Langley and Wakefield. 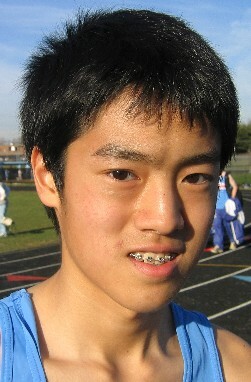 A key member of the 4x800m team that run the fastest time in five years. Jan. 9th to Jan. 14th, 2004. 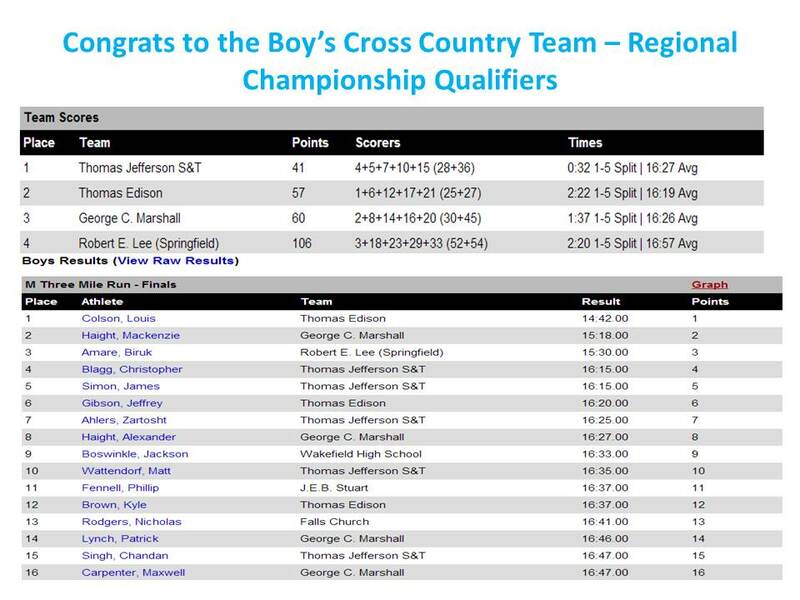 Automatically qualified for Liberty District Championship by running the 12th best time in Northern Virginia Regional, this season. 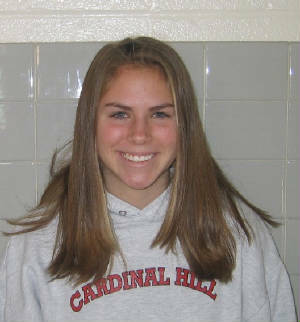 Schiller was a key member of the 2003-2004 team of all Freshmens that finished runner up in the 4x200m and 4x400m relay team at the Championship. Won the 500m dash in a personal and team best time @ the Five Way meet versus Robinson, Centeville and W.T. Woodson. 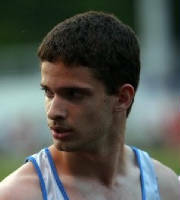 A key member of the 4x400m team and ranked number 2 in the 300m dash. Dec. 29th to Jan. 8th, 2004. 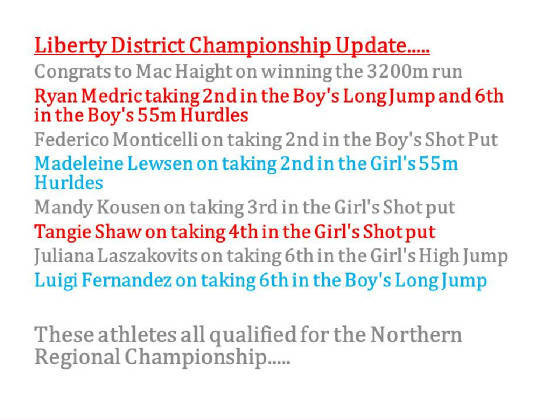 Automatically qualified for her second event for the Liberty District Championship. 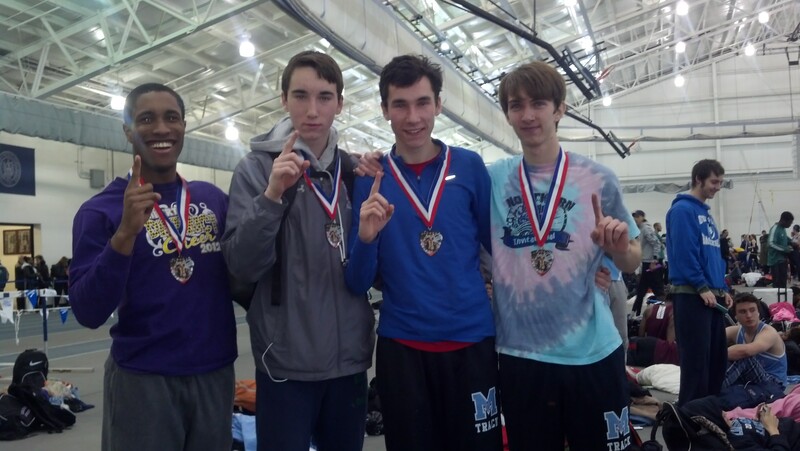 Ran the fastest time of the season in the 55m (7.80) and was the fastest leg on the seasonal best 4x200m relay team. Perviously, qualified for District in the 300m dash (45.04) and was All-District Honoree as a freshman in soccer. Placed 5th of 40 competiters at the highly competitive F.I.T. Invitational High Jump competition with a personal best and District Qualifying mark of 5ft 10in. Also, had personal best and Liberty District Qualifying mark in triple jump (38ft 8in) and another personal best in the 55m dash (7.31). He is the reigning indoor and outdoor MVP. Dec. 18th to 28th, 2004. Won 55m dash, 300m Dash, Long Jump and placed 2nd in the high jump. 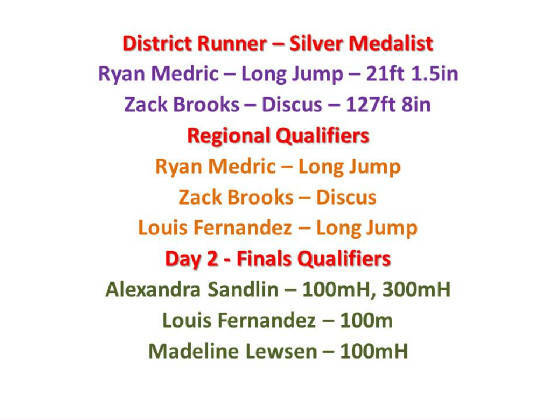 Automatically qualified for regional in 300m and qualified for District in 55m, Long jump and high jump. 3rd - Long Jump (19ft 4.25), 6th - High Jump (5ft 4in), 7th - 300m - 40.14. First to go over 19ft in five years in a Liberty District Qualifying mark. Dec. 10th to 17th, 2004. 1st place - 4:27.74 - Regional 8th ranking. 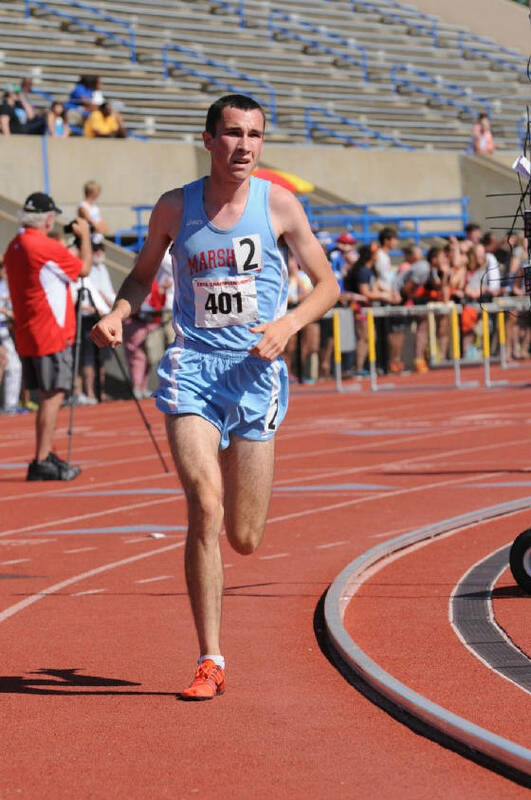 4th - 1000m Run 3:03.54- ran sprints and jumped last year. 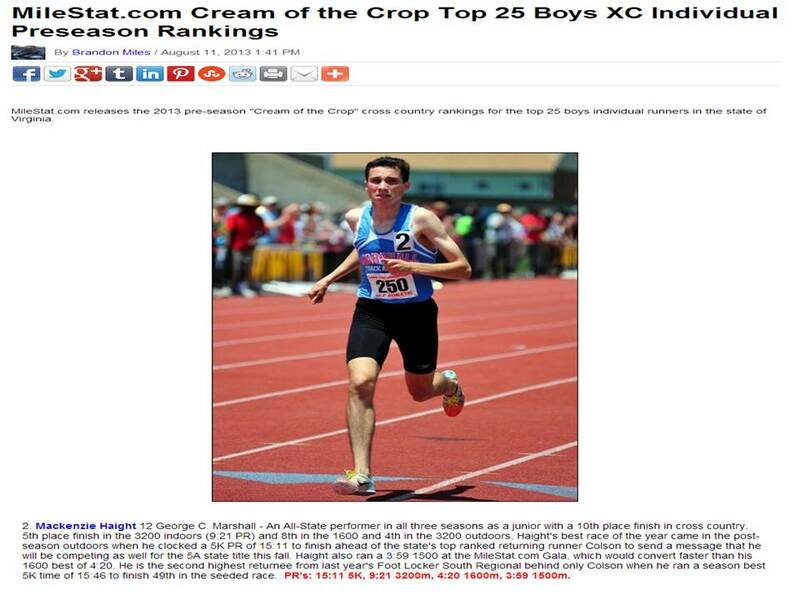 *1600m runner up 2001 Outdoor Liberty District Champs. 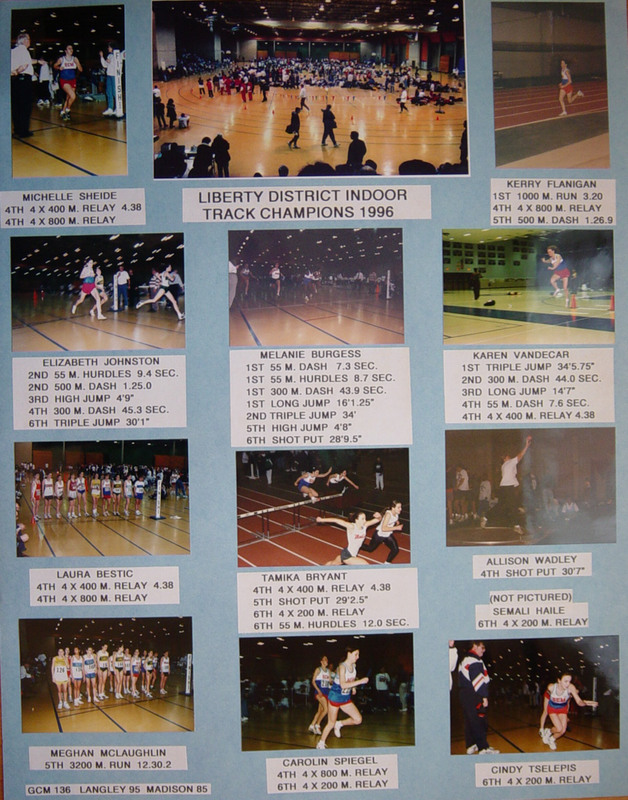 *1600m runner up 2004 Indoor Liberty District Champs. 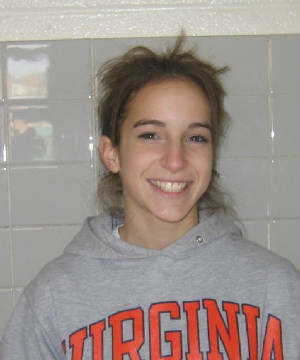 *1600m Bronze medalist 2004 Outdoor District Champs. 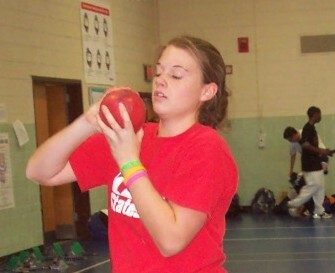 *First year doing throwing and she excelled as the season got better. Freshman Jacqueline Hargrove captured 100m, 200m and 400m for a second week in a row at final home meet on May 12th, 2004. 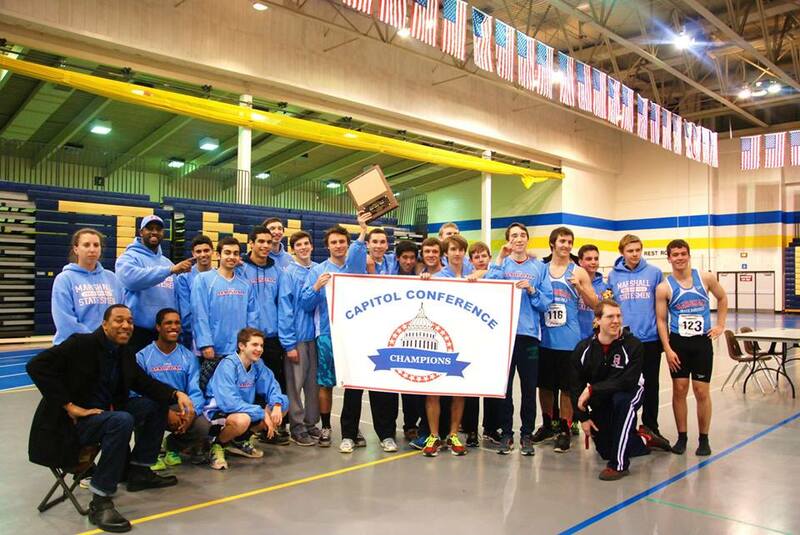 Congrats to the Boy's team for winning the Dual meet versus Lee, 79 - 38 on May 5th, 2004. 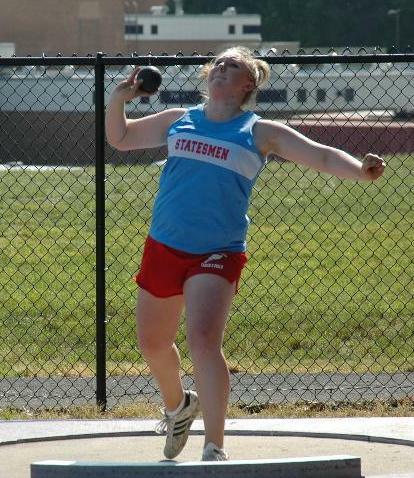 Junior Kaitlyn Johnson won the Discus and Shot Put in her second meet this season. Her throw of 77ft 11in was a personal best by over 11 feet. 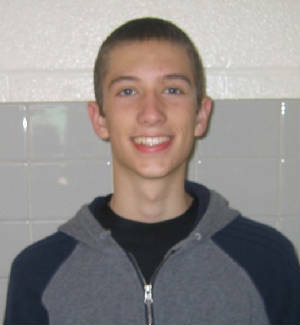 Sophomore Joel Ryan won the 400m dash in a Liberty District Championship automatic time of 53.74 at the tri-meet versus Madison and Fairfax on Apr. 28th, 2004. 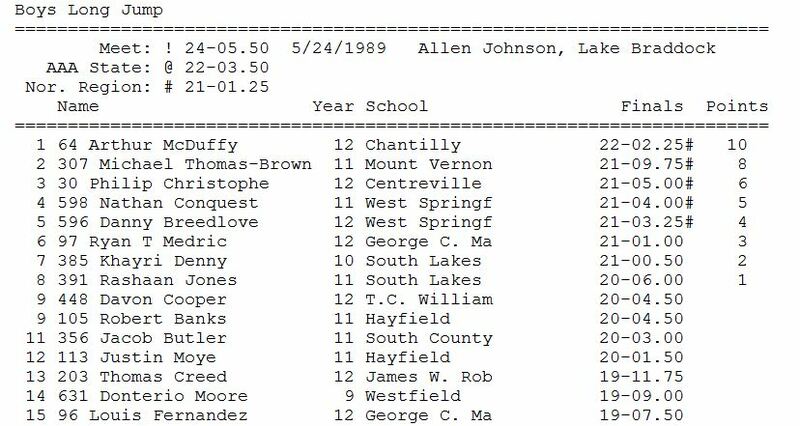 He also grabbed 2nd in the 200m dash in another Liberty District qualifier. Sophomore Theo Robinson equal his personal best in the high jump for the second meet in a row in capturing 6th place in a Liberty District Qualifying mark at the Allen Johnson Invitional. Freshman Jacqueline Hargrove improved on her Regional qualifiers in the 100m and 200m dash at the Allen Johnson Invititional. 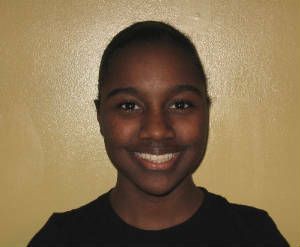 She also qualified for the District Championship in the Long Jump. Freshman Jacqueline Hargrove won 200m dash at the Metro Run and Walk Northern Virginia Invitational with a N. VA Regional qualifying time of 26.49. 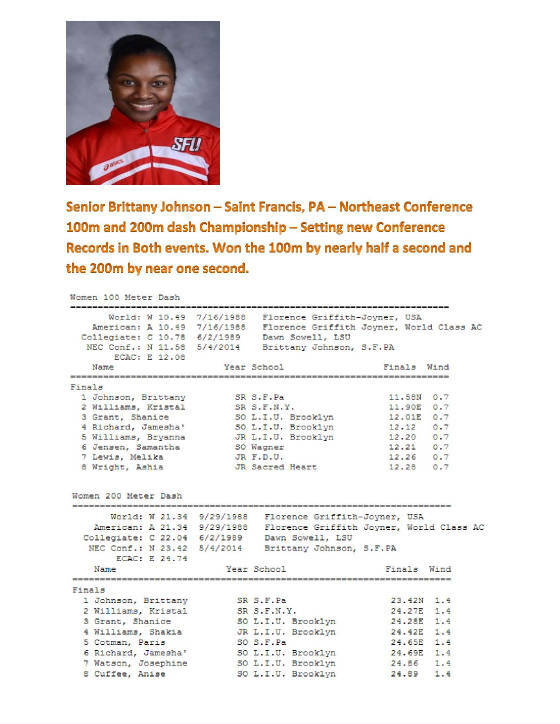 She placed 2nd in the 100m dash with another regional qualifying time of 13.00 and 4th in the Long Jump competition. 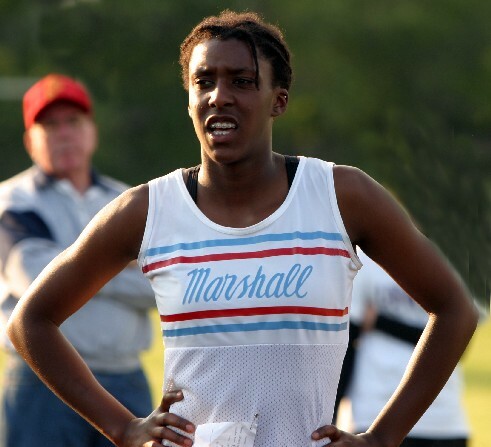 Freshman Nicole Harrison obtained District qualifying marks in all four events she competed including a 4th place finished in the 400m dash at the Allen Johnson Invititional. Freshman Nicole Harrison competing in her second meet of the week and captured two medal in the 400m and the High Jump at the Metro Run and Walk Northern Virginia Invitational. 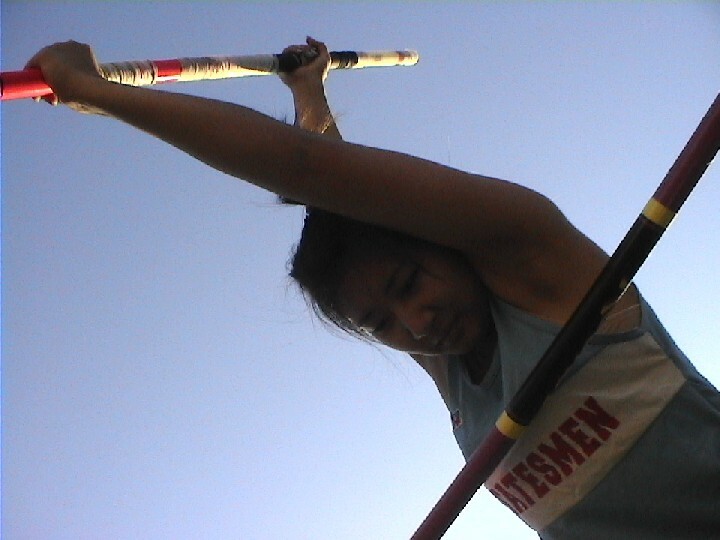 3rd - High Jump - 4ft 6in. 7th - Long Jump - 13ft 10in. 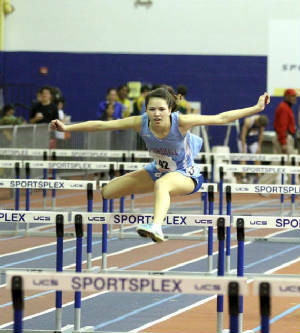 Freshman Nicole Harrison dominated the competition at the first spring track and field meet of the season against McLean and W.T. Woodson. 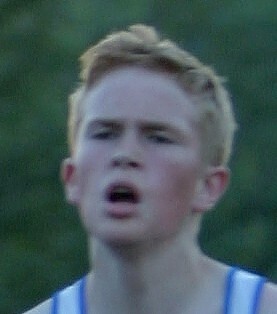 Harrison won all four events with Liberty District Championship automatic qualifying performances.